We all know that a picture says a thousand words, even though the message is usually conveyed in fewer than that. I am talking about those universal, easily understood and invariably “No” signs. No smoking, no food, no ice cream, no.. just about anything these days. How often have you seen a sign that actually allows you to do something? They are extremely rare. The “no something” signs are usually posted by the holier than thou crowd. The know-alls. The do-gooders. Health fanatics. The whiners. Spoilsports. All those people who haven’t got a life and don’t want you to have one either. Generally, they have no reason, right or legal back up to paste these forbidding signs up. They are arbitrary declarations of “Do no whatever it is I dislike”. Ever had the urge to fight back? To do the unallowed right there? Of course you have, but your polite upbringing and the now widespread respect for everybody but yourself will not allow you to do whatever it is the sign says you can’t. I’m sure you are all familiar with the signs here, there are many others. 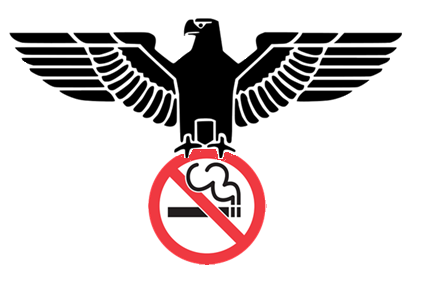 I recently joined a forum for smokers. They aren’t fanatics, they merely want the freedom to choose. 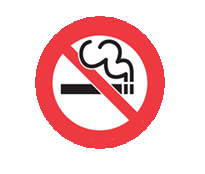 For example, why should all the pubs in Great Britain be subject to a total and all encompassing ban on smoking? Why are there no “smoking pubs” and only “no smoking pubs? Why has that choice been removed? Even some landlords and their staff smoke. But not in the pub. They have to go outside. The landlord can’t smoke in his own home. It is ruining the trade. Pubs are closing all over the country because the people who used to go there to socialise don’t go there any more. The non-smokers don’t go there either. Mainly because there are so few left to socialise with. Something is very wrong when even the non-smokers go outside in the cold and wet to the smokers area simply for the lack of human contact inside the bar. Nobody likes to be treated like a second class citizen, so the pub-goers are staying at home and drinking with friends in their own living rooms. Smokers and non smokers alike. This is what any total ban brings. It is a silent revolt by many mistreated people. Unfortunately, many innocent people are losing their livelihoods because of it and a thoughtless, we-know-best government decision to remove the possibility of choice from the people. One smart person has come up with a simple device for anyone and everyone who is feeling similarly oppressed by any ban. One simply attacks the sign. Not by destruction or defacement. More by embellishment. He has suggested that we print up a simple sign of an eagle. The bird, in its present position, is well known from the nazi era of the last century. Sticking the eagle above the sign gives it a superb quality which basically says it all. Any sign can be embellished in this way, making it very clear what state the country now appears to be in. How about that for silent protest? My many thanks to “Hughster”, from the F2C website. As I have mentioned before, my tobacconist is moving. I buy my tobacco from what I believe is probably the last of the great blenders. I have my own recipe for my pipe tobacco. It is a blend of 80% rough cut virginia, and equal amounts of burley and latakia. I am currently considering having a little perique added to the blend but conservatism holds me back as yet. My tobacconist is Poul Olsen’s My Own Blend. The parent company, Orlik Tobacco, has bought up the Danish department of Davidoff and has decided in its infinite wisdom to combine the two shops in the old Davidoff premises, which means that my comfortable little tobacco shop is closing as such. I suppose the idea is to create a sort of “Gentlemens equipper” with everything from pipes to aftershave and fine spirits.Today was the last day. I went off to visit. I needed to buy tobacco anyway, so the journey wasn´t entirely just for the chatter. Thinking I could sort of sneak in and get out quickly, as I had other things to do, was hurredly thrown overboard as I ran in to some of my mates from my pipe club who were also bargain hunting and visiting the shop for the last time in its present form. We decided to break all the anti smoking laws for the day and promptly filled our pipes and lit up. The guys that staff the place were elated. Memories of how it used to be came drifting back as the smoke began to permeate through the old woodwork and display cabinets full of fine hand made Danish and foreign pipes. I have rarely seen so many customers in the shop at one time. Business was brisk on the last day. Congratulations, hopes of continued success, hand shaking and well wishing. I couldn’t help feeling that the tobacconist is part of my extended family. People come there that I know. My friends are there. I hear news of others that I haven’t seen for some time from the staff. We can leave messages for each other there. “Say hello to… if he drops in”. “So and so was here last week, he said, did, bought..” and so on. “This guy is ill, this one’s on holiday in wherever, did you hear about?..” A mine of invaluable gentlemens gossip. The place has been a part of my social network. It would be a shame if that went down the drain. I realise that things change, that there are people that will make life changing decisions for me without my consent or consultation. Like this bloody ridiculous smoking ban, which is the most anti social piece of legislation ever thought of in human memory. I can’t help wondering if that hasn’t had something to do with Orlik’s decision to amalgamate my tobacconist with a bloody expensive perfume store. Still, I’ll have to give it a chance. No point passing judgement before the trial is over. I just hope I get to be as content with the new premises as I was with the old. I went shopping today. Not just any old shopping. My tobacconist is moving the business to a new address where two businesses will be amalgamated into one. The excess stock has to go. Including some very nice and very valuable pipes. Armed to the teeth with my trusty credit card, I drove into the heart of Copenhagen, determined to find that certain something that will afford me a great deal of pleasure. My pipe collection has grown larger during the past few months, so I am not in direct need of a new pipe. My birthday and Christmas brought riches beyond my desires and I am not one to just dash off and buy a new pipe, but occasionally circumstances outweigh commonsense. This was one of those occasions. Here’s a quick resumé of my luck going back to mid November. 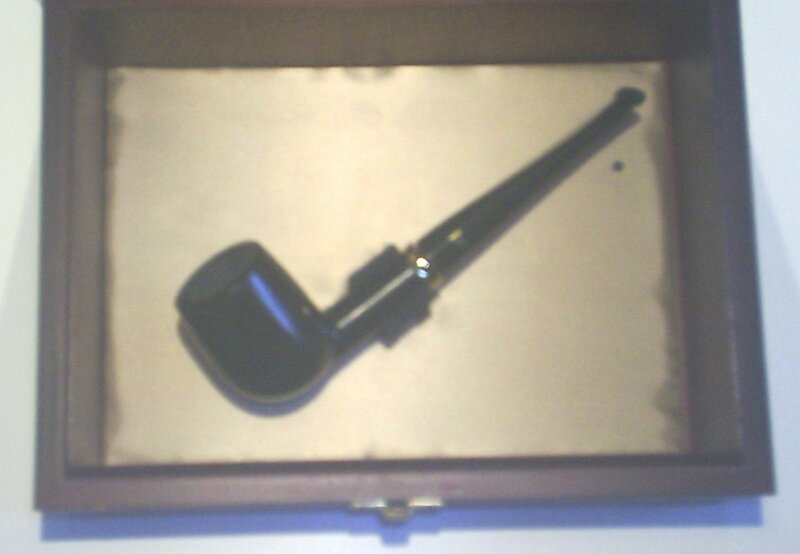 My wife, bless her, bought me a pipe on my birthday in November. 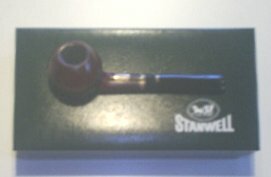 A Stanwell pipe of the year from 2006. A lovely little pipe, reminiscent of a Rhodesian cut. Light and easy to hold in the mouth or the hand, it is a lovely pipe. She got it at half price because the shop was discontinuing its business with pipes and tobaccos. Which is unfortunate for me as a customer, but fortunate for me as a collector. I had to go and see what was going for grabs. 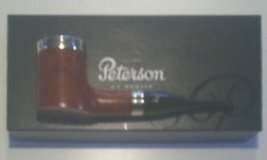 I found a Peterson pipe of the year, also from 2006. With a silver cap on the bowl and a ring on the shank, I couldn’t say no to this pipe at half price. Described as a poker cut, the pipe is flat at the bottom and will stand alone on the table top. Which means you can put it down and it won’t roll away. Despite its size, it is not heavy and sits nicely between my back teeth! For Christmas, my dear lady gave a superb pipe. A Masterpiece edition from Stanwell, hand cut by Tom Eltang. I have met Tom. He cuts all his pipes in the hand. Machining is kept to a minimum. This is a jewel of a pipe. 12 layers of laquer seal the woodwork. The pipe is flawless. It comes with a sturdy wooden presentation case, certificate of origin, cotton gloves and a pouch for transportation. Delightful! And so, to today. I was looking for a competitor to all the above. I found one. A Peterson again. 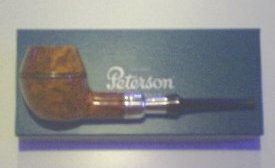 Long neglected and, perhaps because of the price, a forgotten limited edition pipe from 2002. With a silver army mount and big enough to fill my somewhat large hand, this is a well balanced piece of elegant flamegrain briar. The boring in this pipe is gorgeous. The bowl and air shaft meet beautifully dead centre in the base of the bowl. I got it at half price. Having smoked it once, very gently, I know this is going to be one of my favourites. I have always wanted a pipe with a silver army mount. Forgive my amateurish attempts at photographing these beautiful pieces of art and craftmanship, but I believe that a thing of beauty should be seen by all. Four collectors pipes in three months. Who’s a lucky boy then? Nor any a drop to drink. Please forgive me, Samuel Taylor Colleridge. But I couldn’t resist borrowing the line from the “Rime of the Ancient Mariner“. We were invited to a christening today, so, like it or not, we had to go to church on a Saturday. I am not religious by any means. Atheism has its grip well and truly on my sense of rationality. I cannot put my faith in a supreme being any more than I can believe in fairies at the bottom of my garden. However, I cannot deny the others the right to do so, so I must defer to them on these occasions. The church was packed. There were three families, all determined to have their latest addition to the family christened in the name of “the Lord”, amen. Due to the size of the church, which wasn’t big, I found myself standing at the back. My wife found a pew right at the front but I declined the offer to sit there in the company of strangers and partake in a ritual that I do not particularly believe in. I’m no hypocrite, after all. I allowed someone else the pleasure of seeing what went on at close quarters. We were to sing hymns. Music poured forth from a huge organ. No one knew the words or the tune. That happened twice. Then everyone was asked to repeat the creed. No one could remember it apart from the priest, apparently. There was frantic leafing of the psalm book going on all over the place. Finally the great moment arrived. The parents of the three children, plus Godparents, were called forward with the infant children who were then doused with holy water, three times each. One more hymn, again, which no one knew, and we were out of the church. Our little one took it all quite well. He didn’t bawl, squeak or protest. In fact he looked all but interested. His ordeal over, he looked tired and bored. Now officially named and recognised in the parish, he couldn’t have cared less. I couldn’t help wondering as I stood at the back of the church about the innocence of these children. I remember the priest praying for the absolution of their sins. They aren’t even a year old yet, and they need absolution? For what? They haven’t done anything wrong yet. Which is part of my reasons for not believing. The presumption that we are all sinners, despite how well we try to live. That we are all wrong-doers in some way. But I suppose that is inherent in all religions. The demands are absolute and impossible to live by to the letter. It’s all about being guilty before you even get started. You are doomed to failure. I reckon we were all decorated with albatrosses years ago. I know of one youngster who got his today. By the way, read the poem. It’s a corker.